Not exactly portable, but it's got game in spades. If there’s any gaming laptop as recognizable year-to-year as Razer’s Blade line, it’s probably Alienware’s. Following a redesign a few years back, the humbly named Alienware 17 has stayed pretty much the same ever since, at least on the outside. And you know what that means: Time to hit the gym if you want to do anything with this laptop besides set it on a desk and forget about it. The Alienware 17 R4 (currently priced at $2,549 on Amazon) is still so big. Just staggeringly huge. With so many following Razer’s lead and slimming down to actual laptop size as opposed to so-called “desktop replacements” proportions, I keep expecting Alienware to do the same. But no. Year after year, Alienware’s laptops remain gigantic—the better to disperse heat, and therefore utilize the full (or fuller) potential of all those expensive parts inside. I get it. Really, I do. You’re paying for performance, you want that performance, and Alienware’s 17-inch laptop will give it to you. (More on that later.) But it’s damn near impossible to haul anywhere, so don’t buy this machine thinking you’ll use it like a laptop. Or put it on your lap at all, really. During this review I had occasion to take the Alienware 17 out of the country, and here the absurdity of the situation really hit home. It didn’t even properly fit in the 17-inch laptop case I use for my Blade Pro day-to-day, so I just shoved the Alienware 17 in as best I could and prayed. And at just over 9.5 pounds, carrying it through the airport was a Herculean effort. I left it in my hotel for six days, and it was great for some late-night gaming, but phew. Never again. Size aside, it’s quite a pretty machine. Alienware’s standard chrome-and-black color scheme is still one of my favorites—straddling the line between flashy and professional. 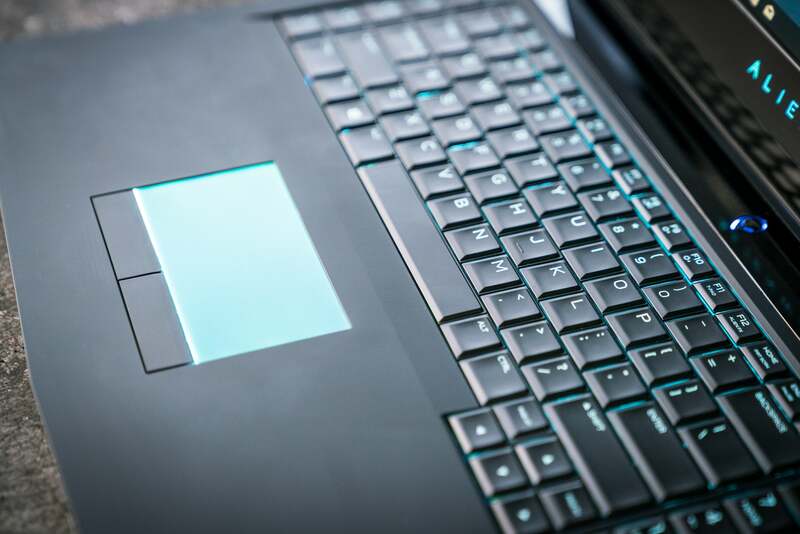 Alienware also has an eye for the small details, from its understated type-logo underneath the display to the row of macro keys unobtrusively arrayed to the left of the keyboard. And if you love RGB LEDs, Alienware’s the competition to beat on that front. The keyboard is only zone-lit, which is a shame, but there are also RGB LED light strips embedded in both sides of the laptop and in the lid, as well as underneath the trackpad. That last bit is weirdly useful—I like a backlit keyboard, so of course I’d appreciate a backlit trackpad. The better to guide your fingers with, right? Again, flashy, but in that vaguely high-tech way only Alienware really attempts. The display presents a tough choice for enthusiasts: The Alienware 17 comes in both 1440p and 4K models, but the 1440p version also boasts a 120Hz refresh rate and integrated G-Sync. It’s also slightly brighter, at 400 nits to the 4K model’s 300 nits. Personally I’d go for speed over resolution, especially at 17 inches, but everyone’s got different preferences, I know. In either case, you can also opt for integrated Tobii eye-tracking. I spent a bit of time with this during my review, and have also spent time with the standalone desktop version. It’s kind of novel navigating your desktop with your eyes, and I imagine even more useful for those with disabilities, but I don’t think it’s must-have technology for the average user. As for its use in gaming, there are a few high-profile titles like Deus Ex: Mankind Divided, but it’s far from pervasive. My two biggest complaints pertain to the rear of the machine. Instead of a normal laptop setup—which is to say, hinge at the very back—the Alienware 17 instead has the hinge set in approximately 1.25 inches. Now, there’s a reason for this: heat. The fans all vent through this section at the rear of the chassis, meaning it gets uncomfortably warm. Not something you’d want to touch, nor something you’d want venting right next to the keyboard. It’s ugly, though. Compared to the space-age lid, Ventilation Row looks like it was slapped on as an aftermarket part. 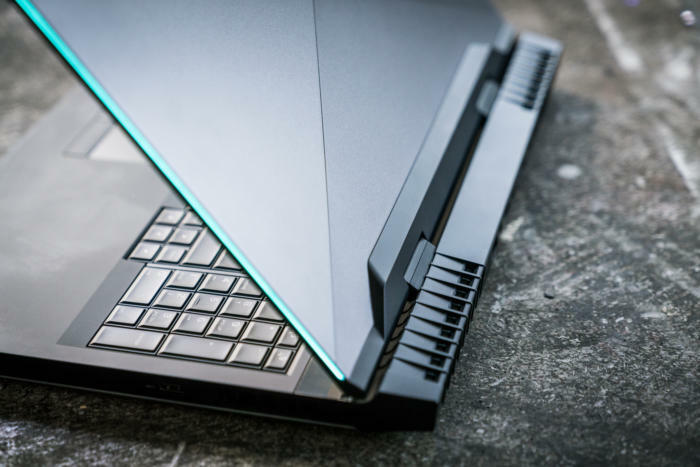 It’s also part and parcel with the Alienware 17’s size problems, as the laptop isn’t just the size of the 17-inch screen, but that plus this fat ol’ hinge-and-vent outcropping on the back. It’s surprisingly loud, too. I thought placing the fans behind the screen might dampen the sound a bit—if so, it’s not by much. Even under a moderate load the Alienware 17 can get noisy, and under full load (like when gaming) it all but requires a headset or headphones. On a positive note, the fans are less high-pitched and whiny than I've experienced in thin laptops like the Blade Pro, but you probably won’t appreciate the difference much when it’s drowning out your game. My other big complaint is that power (as well as the proprietary Amplifier port, HDMI out, and ethernet) plugs into the rear vent area, on the back of the laptop. 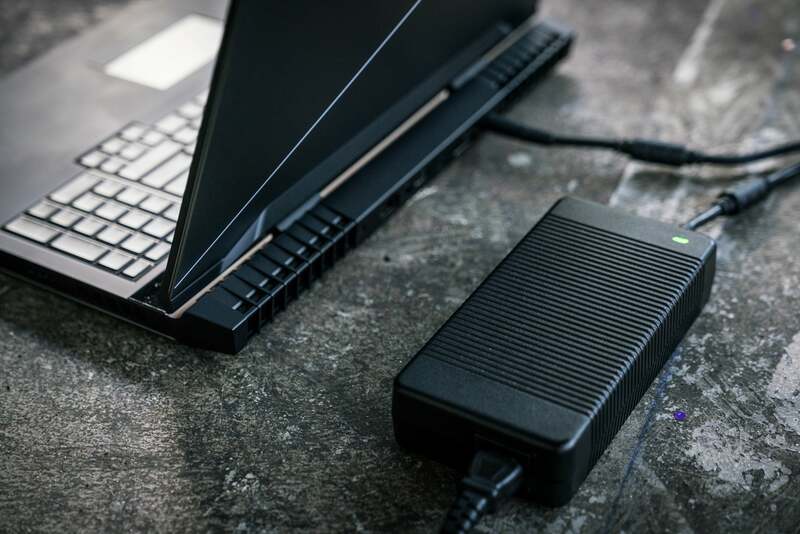 Alienware is hardly alone in this, especially when it comes to these massive desktop-replacement devices, but wow it can be annoying to try to plug in your laptop when you can’t even see the port. Speaking of which: The power adapter is also gigantic, adding another 2.5 pounds to your carry weight. Again, this isn’t an Alienware-specific issue, and is typical for a desktop replacement. It’s just one more contributing factor to the Alienware 17’s dubious portability. Hauling around the laptop is bad enough. Hauling around the laptop and the charger? Injurious. It’s not optional, either. Like most gaming laptops, the Alienware 17’s excellent performance (I’ll get to that) comes at a cost: mediocre battery life. 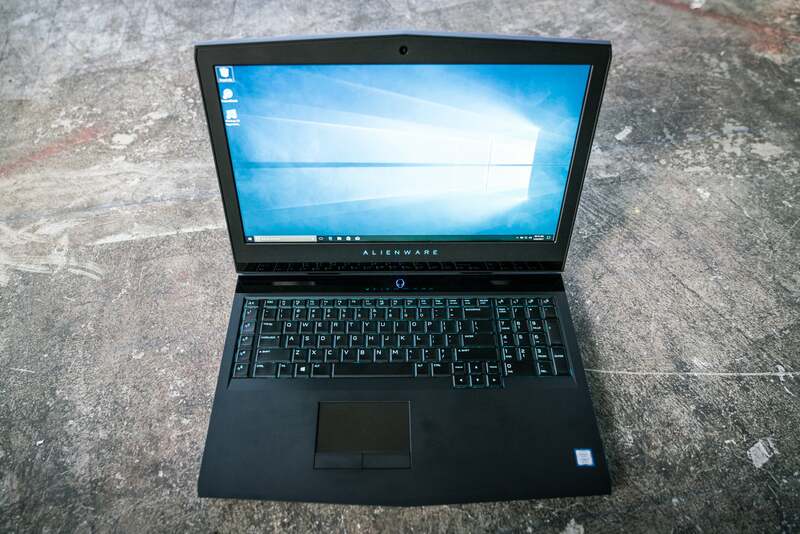 In our standard rundown test, wherein we loop a 4K video file until the battery dies, the Alienware 17 lasted 3 hours and 8 minutes under load—not bad for a laptop of this size, but certainly not enough to last you through the day. It’s worth it, though. Oh goodness me, it’s worth it. The performance gap between slim Blade Pro-style laptops and these behemoth desktop replacements has narrowed in recent years—and the competition will likely get even more fierce as Nvidia’s new Max-Q parts hit the mainstream. But there’s still nothing quite like a so-called “desktop replacement” for getting desktop-quality performance. 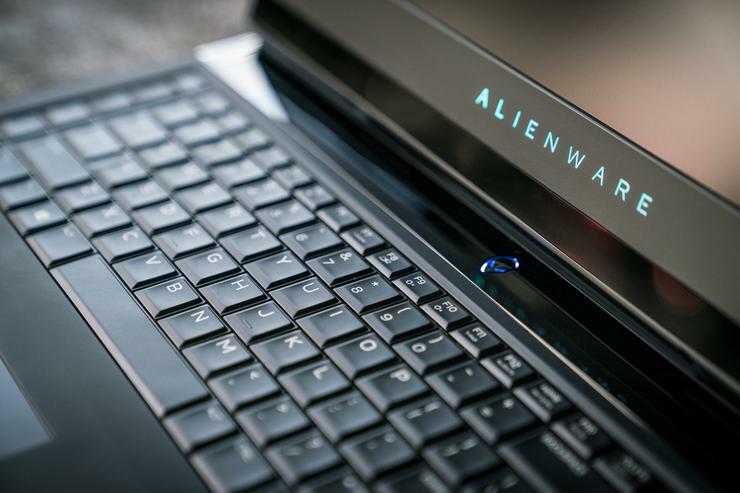 The Alienware 17 we reviewed came equipped with an Intel Core i7-7820HK, an Nvidia GeForce GTX 1080, and 16GB of DDR4 RAM clocked at 2,400MHz, plus 500GB of SSD storage and an additional 1TB of hard drive space. We've seen some laptops more powerful than this one, but it’s up there. That i7-7820HK is the Alienware 17’s strongest asset. Most laptops top out at the i7-7700HQ—a perfectly respectable processor in its own right. Indeed, the difference between the two is only 100MHz, with the 7700HQ clocked at 2.8GHz (3.8GHz Turbo) and the 7820HK at 2.9GHz (3.9GHz Turbo). 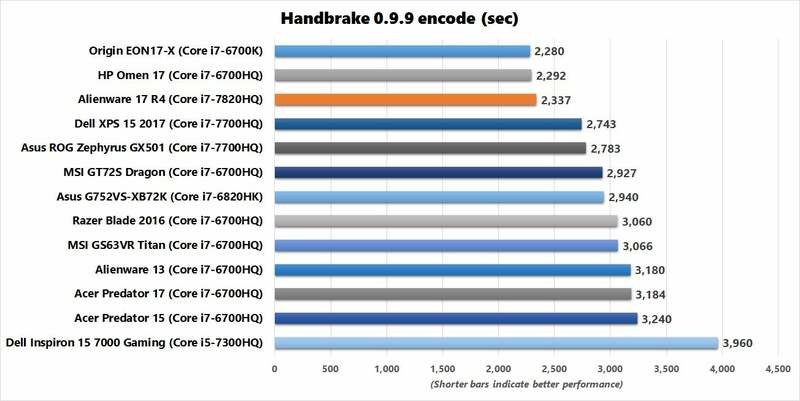 The advantage still goes to the 7820HK, though, and you can see it clearly in our Handbrake test. We feed a 30GB file through Handbrake to see how long it takes for the system to it render down to an MP4, using the Android Tablet standard—a CPU-intensive task. Our 7820HK-toting Alienware 17? A little under 39 minutes. An Alienware 15 with a 7700HQ? Almost 46, for a difference of about 7 minutes. The same goes for other 7700HQ laptops like the Gigabyte Aero 15 and the Asus ROG Zephyrus GX501. Then there’s the GTX 1080, a powerhouse in its own right. Here we see some interesting behavior vis-a-vis Nvidia’s crop of Max-Q laptops—and the performance advantage when you buy a full-size desktop replacement like the Alienware 17. 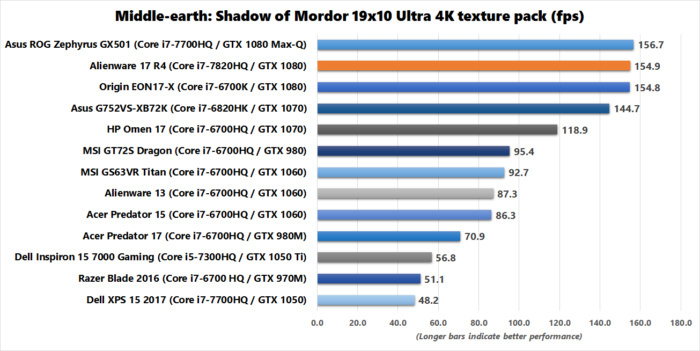 See, in short benchmarks the Max-Q laptops match or even outpace the Alienware 17. By “short” I mean pretty much any in-game benchmark, as these typically only run for a minute or two. 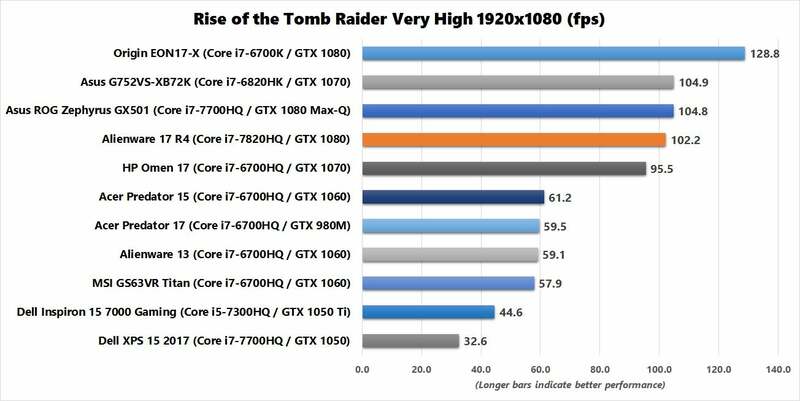 Looking at Rise of the Tomb Raider, for instance, you’ll see that the Alienware 17 ran at 102.2 frames per second, and Asus’s Max-Q 1080-sporting GX501 at 104.8. The same matched-or-slightly-exceeded behavior is seen in Middle-earth: Shadow of Mordor, where the Alienware 17 posts 154.9 fps versus the GX501’s 156.7 fps. Interesting, right? If Max-Q is that good, it seems like it would completely negate the need for an oversized laptop like the Alienware 17. But Max-Q works only in short bursts. Remember, the key advantage to a laptop like the Alienware 17 is heat management and venting—an aspect that doesn’t make much difference in the short term but makes a huge difference in the long(er) term. Enter 3DMark, with its longer benchmarks. Here, you consistently see the Alienware 17 outpace its Max-Q competitor. In 3DMark’s latest TimeSpy benchmark, the Alienware 17 scored a 6,538 versus the GX501’s 5,489. 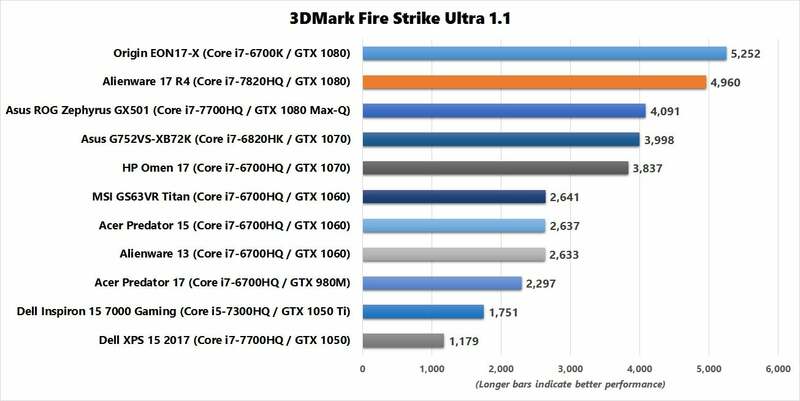 The same gap exists in Fire Strike Ultra, where the Alienware 17 posted 4,960 to the GX501’s 4,091. 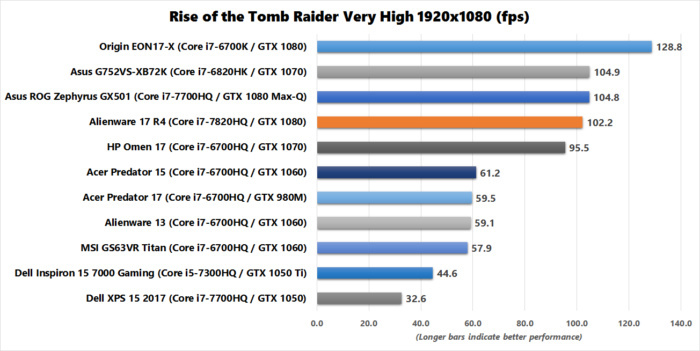 In fact, the GX501 performs more like a 1070 in these longer tests. The aforementioned Alienware 15, which packs a 1070 in addition to its i7-7700HQ, put up scores of 5,386 and 4,097 in TimeSpy and FireStrike Ultra, respectively. As my colleague Gordon Ung so succinctly put it: In Alienware’s machine, the 1080 gives you full 1080 performance all the time. I’m not here to throw Max-Q under the bus. On the contrary, I think a Max-Q laptop with its lighter-weight design is probably more practical for most people day-to-day. Pound for pound, Max-Q has the performance edge. Alienware gives you desktop performance, though, and under greater duress. All that heat management adds pounds, but the Alienware 17 vents like a pro, and the result is going to be better graphics, and a better and more consistent frame rate. Of course, you could do better if you opted for a desktop replacement with a desktop-class CPU, like the Origin EON17-X—but it'dl sure cost you. There are rough edges. Zone backlighting is a bit outdated, the fans are loud, battery life is average, and the extra inch-plus of venting adds insult to injury in terms of the Alienware 17’s size. I’d love to see Alienware branch out and bring its unique aesthetic to a thin, lightweight Max-Q laptop one of these days. But the Alienware 17 plays to the company’s strengths: performance, performance, performance. This machine’s got it in spades, handily outpacing what we’ve seen of the new Max-Q crop so far and proving the importance of good thermals. It’s one hell of a desktop replacement.